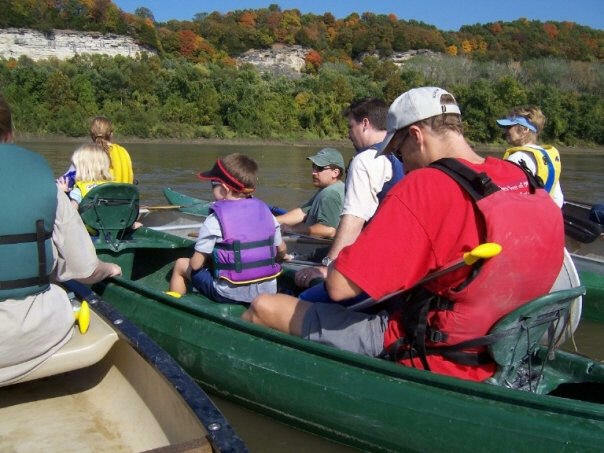 Missouri River Canoe & Kayak Float Trips & Tours. Mighty MO Canoe Rentals. Rocheport, Missouri. Between Kansas City and St. Louis. Near Katy Trail, Columbia, and University of Missouri-Columbia. Float Through Life... Paddle Through History! 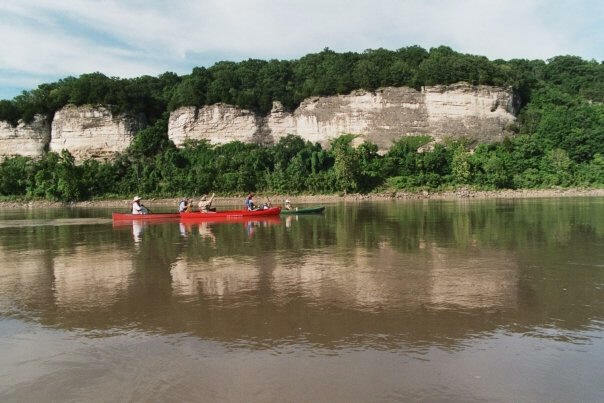 Come paddle the Missouri River through its most picturesque Mid-Missouri scenery. The towering bluffs and forested banks rekindle the aura of the days of Lewis & Clark. Join our guided canoe & kayak excursions for a first-hand exploration of our country's great river and our nation's epic history. Our small groups of canoes and kayaks offer both beginners and experienced paddlers an intimate trip setting and scenery they will never forget. "Up close, the river seems both grander and friendlier than most of us imagined." We depart each Saturday at 1 p.m. from the Katy Trail Bed & Bikefest in historic Rocheport, Missouri. By reservation only (this helps us to plan accordingly). Please reserve your spot or check availability by clicking here. 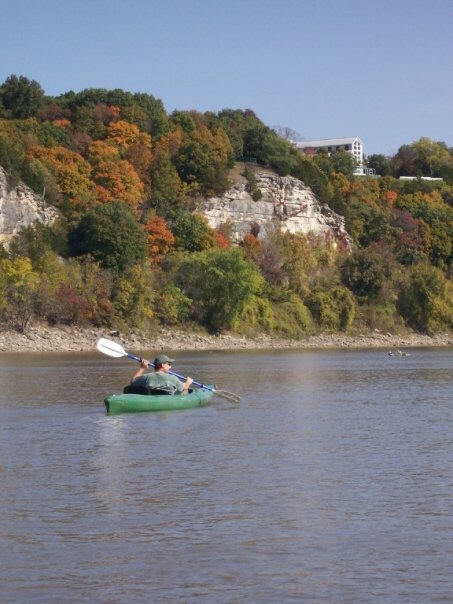 The $35 per person cost includes canoe or touring kayak rental, guide service & shuttle back to Rocheport. A group of paddlers "rafts up" to listen to their guide, Brett Dufur, read from Lewis and Clark’s journals, and to hear what he's learned about the Lewis & Clark Trail when researching and writing his guidebook Exploring Lewis & Clark's Missouri. Our guided tours from Rocheport to Huntsdale pass the Manitou Bluffs, the most photographed portion of the river valley in Mid-Missouri. We will be offering guided trips every Saturday throughout the season from May through the end of October. As founder Brett Dufur said, ""We're able to watch as this river sort of regenerates itself and reconnects with its historic floodplain. It's like this huge classroom waiting for the students to arrive." Who: We are a diverse group of passionate paddlers, experienced guides & outdoor education professionals who are firm believers in experiential education and eco-tourism. In essence, we love to explore and to share what we have learned about our area's nature, history and more. Safety & top-notch service serve as the foundation for our explorations. 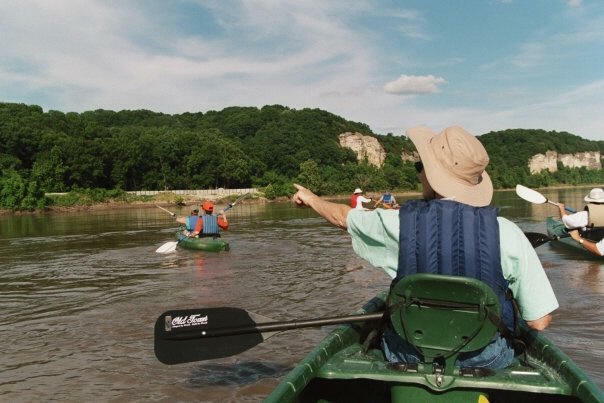 What: Our guided canoe trips take you from Rocheport downriver to Huntsdale, a total paddle of 6.6 miles on the Missouri River. Our super stable touring kayaks and canoes make this trip do-able for beginners and long-time paddlers alike. Most first-timers are amazed at how accessible, easy & safe their first paddle on the Missouri River can be. 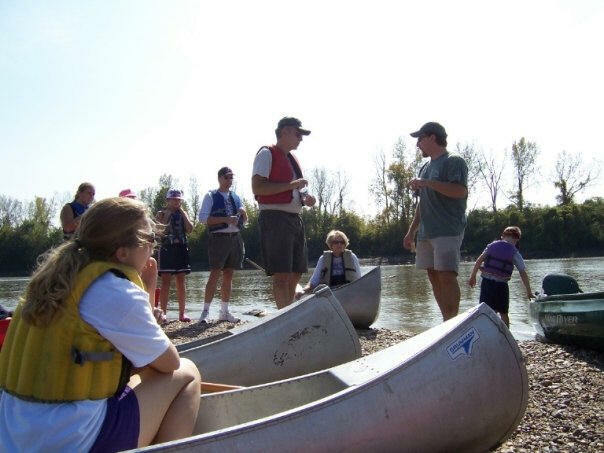 We'll use the river and the sandbars as our classroom as we talk about the area's Lewis & Clark history, how the river has changed in the last 200 years and more. When: We depart each Saturday at 1 p.m. from the Katy Trail Bed & Bikefest in historic Rocheport. Our season kicks off in May, and we will be offering guided floats each Saturday until the end of October. Group floats can also be arranged on other days to accommodate your group's needs. We often do floats for wedding parties, family reunions and college reunion weekends. Where: We depart from the Katy Trail Bed & Bikefest located on the Katy Trail in Rocheport, between Lewis & Clark Streets. We'll float from Rocheport to Huntsdale. The trip lasts about four hours. We timed it to depart at 1 p.m. so that you would have ample time to eat lunch first at one of the restaurants in Rocheport. Once we arrive in Huntsdale at Katfish Katy's Convenience Store, you have the option to ride back in our shuttle vehicle OR grab your bike off our shuttle's bike rack, and pedal the 6.6 miles back to Rocheport on one of the most scenic stretches of the Katy Trail! In fact, you can also camp at Katfish Katy's right alongside the Mighty Mo -- paddle, camp & bike -- the options are entirely up to you! to get out and explore the Missouri River. In the past decade, more than 88,000 acres of the river valley have been acquired to reconnect the river to its historic floodplain. 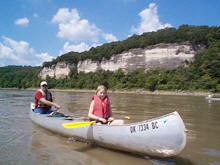 As you paddle, you will enjoy the sights and sounds of one of Missouri's most scenic stretches of the Missouri River. Watch as Great Blue Herons take flight, watch the light cascade across the towering bluffs, and paddle beside restored wetlands. Our experienced guides will make two brief stops to talk about how the river has changed since Lewis & Clark traveled through in 1804. You'll learn more about not only the river's past but its future as well. Learn about early Native American habitation of the area, and catch a glimpse of a faint pictograph high on the bluff face. First time paddlers are often amazed to find that the Missouri River feels more like a slow moving lake than a fast moving river. Visit our Learn More page for answers to frequently asked questions. Visit our Katy Trail page to learn more about several invigorating paddle the river/pedal the Katy Trail and camping options that offer a variety of weekend adventures. Then visit our Reservations page for our schedule and how to sign up. Refer to our Learn More page to find out more about our trip. If you don't find the answer to your question on the website, please email us at pebblepublishing@gmail.com. We answer emails much faster than phone calls since our office is not staffed full-time due to the recession. However, if you need us, please don't hesitate to call us at (573) 698-3903. We will help out in any way we can. Reserve Your Spot Online With Just A Few Clicks! Refer to our Learn More page to find out more about our trip. If you don't find the answer to your question on the website, please email us at pebblepublishing@gmail.com. We answer emails much faster than phone calls since our office is not staffed full-time due to the recession. However, if you need us, please don't hesitate to call us at (573) 698-3903. Site designed and maintained by Pebble Publishing, Inc.